We have a local community paper called The Acorn that covers mainly the east end of Ventura County and it comes out each Friday. Well, due to the increased interest in using Native plants instead of thirsty ones, they will be interviewing me late this afternoon and obviously seeking my experience and tips on transitioning from lawns into a more realistic landscape for our hot and dry Mediterranean climate in S. California. I spent yesterday doing some basic “fluffing” of the plants, a bit of cleaning and some light trimming where it was needed, but I really wish that they had done this story a month ago, when more of the plants were in bloom, because now the garden is going into it’s summer slumber and other than some of the salvias, there aren’t too many flowers to see. And I have one section that has proven to be difficult to grow anything in and it’s right next to the Howard McMinn manzanita, which is doing very, very well. But there is a section between it and the low rock wall where the soil ( if you could call it that), that doesn’t drain very well and I have experienced several failures with plants that hate to have “their feet wet” and right now, it’s looking a bit bare. I will wait until this fall, when the plant sales come up and in the meanwhile keep researching ideas for this section. Like anything else in life, gardening and landscapes don’t always turn out the way we envision them, but in the process we always learn something new and the birds, butterflies and bees that are attracted to my garden, continue to be a joy to me. Oh my gosh. I cannot believe how, very, very long it has been since I last made a post about my garden. I guess I have been too pre-occupied with my daily life and all of the demands it makes upon me. Yes, yes…we all have busy lives, don’t we? However my garden continues to delight me and of course it has changed considerably over the last few years, as I have too. I really feel that tending and loving a garden whether or not it’s one filled with ornamental plants or like mine, more “native” and drought tolerant which is so important here in southern California, that are lives are just a bit richer for it. Everyday, I can observe the different birds that find refuge in it and of course plenty of places to hide, built a nest and find food. The seasons evolve, the plants bloom and recede in the hot summer months, only to catapult back into life with the first winter rains. Lessor Goldfinches and White Crowned sparrows have been enjoying it’s bounty and I know that soon, I will see other avian visitors. Spring is just around the corner and many plants are preparing to put on a show of flowers and color. I promise that I will be writing more. After all, it’s the garden that provides respite for me, too. My life has been a bit upturned the last couple of months because I managed to fracture my right foot when I was just finishing up my workout at the gym. I ended up wearing one of those big, clunky orthopedic boots which was not exactly conducive to walking in my garden and allowing me to spend any time in it this past summer. I am finally out of it but still limited on doing things such as hiking or conditioning walking and I have been told not to do any repetitive movements on my foot until the fracture is completely healed, which at this point it, isn’t. But with the arrival of Fall, I know that soon I will need to be doing a lot of cleanup and maintenance in the garden. 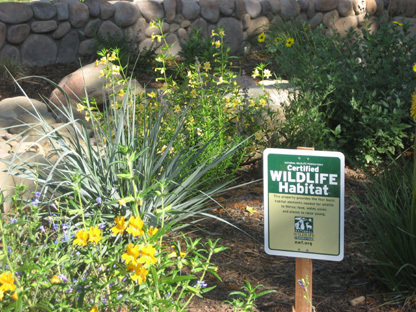 When it comes to using California native plants and in my case those of the chaparral-sage community, there isn’t much to be done during the summer months because most of the plants shut down for the season and become semi-dormant. With the arrival of Fall and then winter, that is the signal to get busy in the garden. The plants are waking up and getting prepared to grow and that means it’s important to groom, trim, prune the plants that need a “spa day” and of course it’s the best time to do planting. Plus I have a number of projects in mind this season and am only waiting for the weather to be cooler before I get involved in them. Although it is quite hot here today, about 102 degrees which is typical for Fall in Southern California. I know that I will be removing more plants in the next few months but I will need some help when I do. I can’t do any digging with my right foot to remove the plants I want to take out. So I will be hiring my P/T garderner, Nelson to do the heavy work. It is approaching the 5th. year when I decided to remove my lawn and put in it’s place, native plants and I’m finding it difficult to believe that it flew by so quickly. But since that time, there has been more discussions, books and articles about creating landscapes based upon using less water, no fertilizers or pesticides and becoming sustainable. And not to forget, the joy of drawing wild birds and butterflies into a new “wild” space. Especially the humming birds…..
I’m happy that I have done my part and I certainly have learned a great deal about using natives for landscaping. And yet, the adventure continues as I learn more about this unique method of landscaping. And I’m already thinking about the changes I will be making to the garden in the next few months.